Xiaomi's mega launch event took place in Shenzen, China where the company launched the Mi 8, Mi 8 Explorer Edition, Mi 8 SE, MIUI 10, Mi Band 3, a standalone VR headset, and a 75-inch Mi TV 4. The Mi 8 was the crowd puller but the MIUI 10 will probably have the largest impact on Xiaomi users. The company will put out the Developer ROM (China version) of MIUI 10 from June 1. The China Developer ROM closed beta will come to the Mi 8, Mi Mix 2S, Mi Mix 2, Mi Mix, Mi 6X, Mi 6, MI 5, Mi Note 2, Redmi S2 and Redmi Note 5 from June 1. The China Developer ROM public beta will be available by late June and it can be accessed by Mi 8, Mi MIX 2S, Mi MIX 2, Mi MIX, Mi 6, Mi 5, Mi Note 2, Redmi S2 and Redmi Note 5. Later in July, the public beta will be made available to Mi 4, Mi 4c , Mi Max 2, Mi Max, Redmi 5, Redmi 5A, Redmi 5 Plus, Redmi 4, Redmi 4A, Redmi 3S, Redmi Note 4, Redmi Note 3. One of the biggest changes can be seen on the recents page of the operating system. 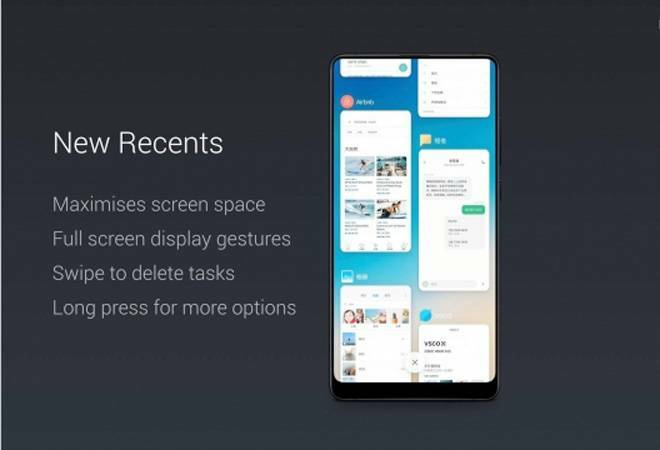 Xiaomi has taken a unique approach to the Recents screen. The new layout lets-in more tasks at a time by placing the windows vertically. The new aspect ratio will be put to use by the full-screen display gesture. To delete a task one will have to swipe and for more options the user will have long press on the task. The new UI will be heavily invested in AI. Even older Xiaomi devices will get the support for features like bokeh effect. The AI will also be able to detect scenes automatically and apply changes accordingly. There is no word on the availability of the Global ROM but Xiaomi smartphone users who want to give the new UI a try can flash it on their respective devices. However, the new ROM will be highly unstable and it's not advisable to use it on a daily driver smartphone. Since the ROM is limited to China, the user will not get Google Play services. They can flash the APK of the Google applications separately.